We had a great view from the second row! Anyone who has read this blog in the past few years may remember Isabelle is a HUGE Maccabeats fan. We own every album they’ve cut and have watched their videos together on YouTube (giving them what probably amounts to over 1,000 hits from our home alone). A few months ago, I heard they were coming to Harrisburg so I picked up the phone and immediately bought tickets. Isabelle must have been excited about the concert since she came home from school on Friday telling me she and her friend Eli discussed it at school. She wanted to sit next to Eli so she recorded a video for his mom asking for permission to sit next to him. His mom texted a video of Eli back a few hours later saying he wanted to sit next to Isabelle too. (How adorable is that?) Luckily, the kids are in Kindergarten so they didn’t even ask to sit away from us (i.e., their parents). We arrived at the theater about 30 minutes before the show started. Isabelle saw other kids from her class, but remained committed to sitting beside Eli, which I thought was lovely. Thankfully, Eli’s family arrived ahead of us and saved seats for us in the second row. Selfie during “Ha Yom” when most people were using their phones as makeshift lighters. Although Eli and some of her classmates left their seats and danced during the show, Isabelle sat beside me with her gaze transfixed on the Maccabeats. She sang several of the songs softly, clapped her hands to other songs, and applauded at the end of each one. “Yes,” she replied somewhat sadly. “Yes, it is,” Isabelle replied. “You can still tell Ari about the concert if you’d like when you get home,” I offered. Sure, I thought, as I grabbed my iPhone. 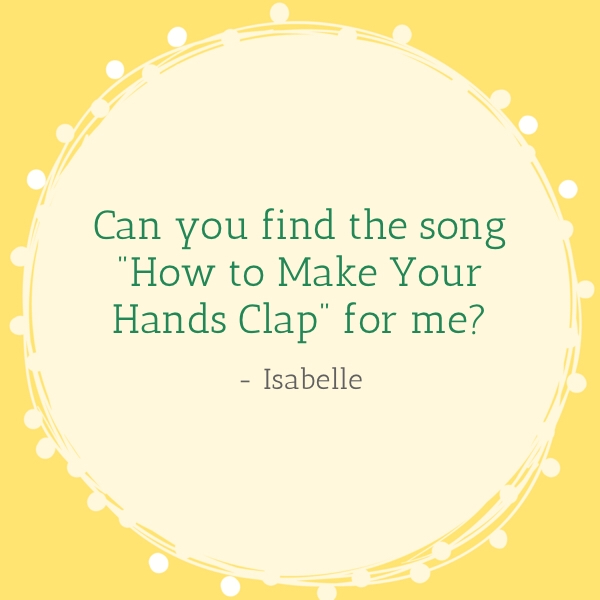 “How do you the ‘HandClap’ song?” I asked. “Ryan sings it at school,” Isabelle replied. Within minutes I found and downloaded Fitz & the Tantrum’s “HandClap.” But then the requests kept coming — in the form of one or two perfectly-sung lyrics at a time. Before I knew it, I downloaded songs like “Play That Song” by Train and “Ride” by Twenty-One Pilots to my phone. I was bewildered that Isabelle knew any of the songs. You see, whenever Isabelle is in my car she always requests to listen to Jewish music like the Maccabeats, Debbie Friedman, or liturgical/holiday music. And while I have a great appreciation for Jewish wedding music, I keep telling my husband I might impale myself if I have to keep listening to the same Jewish wedding CDs over and over again. “How do you know all of these songs?” I asked Isabelle. This is because Marc is wiser than I am. He doesn’t turn on any Jewish music (even though he has all of the Maccabeats albums on iTunes). “But I like listening to Jewish music in your car,” she said. I recalled having this conversation last summer when she came home from camp singing “Cake by the Ocean.” I tried playing the radio in the car back then, but she whined incessantly until I turned it off. I decided to try again today. I switched on the radio for our drive to her Aerials arts class. And do you know what happened? Isabelle sang along. She didn’t ask for me to turn on the Jewish music even once. Listen, I’m happy to play Jewish music for her. It is important for her to be familiar with it. However, it is also important for her to be exposed to all kinds of music — from both of her parents. So, for now, I’ll alternate between the radio, my iTunes playlist, and the Jewish music. At least that’s my intention. Our nighttime routine with Isabelle has been the same for awhile now. I don’t know if it was because she was trying to delay bedtime or because she loves my voice, but Isabelle has been requesting a song before I leave her room for the past two weeks. I tried singing D’ror Yikra, which is a song that used to lull her to sleep as a baby. She wasn’t thrilled with it. So, I defaulted to HaMalach HaGoel, a Hebrew Lullaby I learned when she was two years-old. The Maccabeats sing it and — since she LOVES the Maccabeats — she loves this song. Last week, all I sung, every night, was HaMalach HaGoel. This past Sunday afternoon, we attended a William Close and the Earth Harp Collective concert. They performed “Erev Shel Shoshanim,” which is the song I walked down the aisle to on my wedding day. (It’s like the “Here Comes the Bride” of the Jewish world.) Hearing it performed live made me nostalgic so I offered that up to Isabelle as an alternative to HaMalach HaGoel on Sunday night. She’s chosen it instead of HaMalach HaGoel nearly every night since then… including tonight. And sing I did. I rubbed her back gently. I tucked her wet curls behind her ear. I watched her eyelids flutter closed, though she kept trying to open them in an effort to fight sleep. My breath caught. There I was singing the song I hope she’ll walk down the aisle to one day — many years from now — when she marries. Was this the right song to sing? I mean, I want to pass down songs from our tradition to her at bedtime, but maybe this wasn’t the right lullaby. And with that, I closed her door and she went to sleep. I walked out of her room and stopped questioning myself. Any song that lulls my child to sleep and shares the music of the Jewish tradition with her is a perfectly fine choice. Feel free to let me know which one you prefer! Isabelle and Joanna at the piano during today’s session. I’m going to tell you something parents of typically developing kids don’t know. Therapists, whether they are speech therapists, occupational therapists, or music therapists, become your child’s friends. Maybe that sounds sad to you. And in a way it is. But the truth of the matter is that therapists who help your child from an early age take the place of play dates. Just prior to Isabelle’s Childhood Apraxia of Speech, or CAS, diagnosis in April 2013, she received two speech sessions and one OT session each week. As soon as the diagnosis was given, more therapies came into the mix. At the height of 2014, Isabelle had between six to eight therapy sessions each week. Speech three times a week, occupational therapy two – three times a week, music therapy once a week, and physical therapy every other week. That kind of intensive therapy schedule doesn’t leave a lot of time for play dates. I wish she had spent more of the past year playing dolls or building with Legos alongside a friend. However, I was told her three-year-old year would be a year of growth in terms of her speech development if we devoted our time to intensive therapy and a lot of home practice. 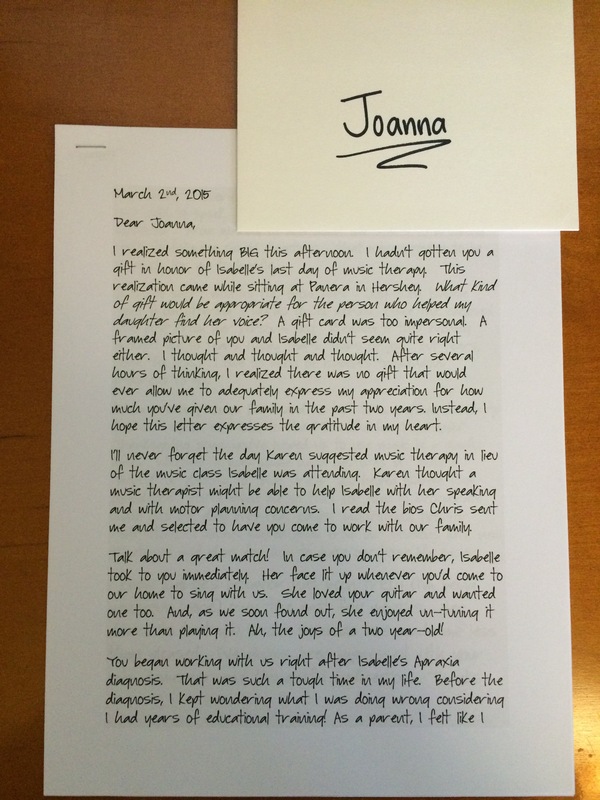 What is an appropriate gift for someone like Joanna? I had no clue. There’s no dollar amount that would be enough. Therefore, I wrote her a heart-felt letter. Isabelle’s final day of music therapy was today. She wasn’t discharged per se (i.e., her music therapist is transitioning to being a full-time music therapist within the Early Intervention system). However, it became a graduation day or sorts, so we celebrated. Isabelle’s music therapist, Joanna, began working with her in April 2013. Joanna began co-treating with Isabelle’s speech and occupational therapists right after the CAS diagnosis. That month, Isabelle was producing 31 words (i.e., substitutions and approximations counted for words back then. 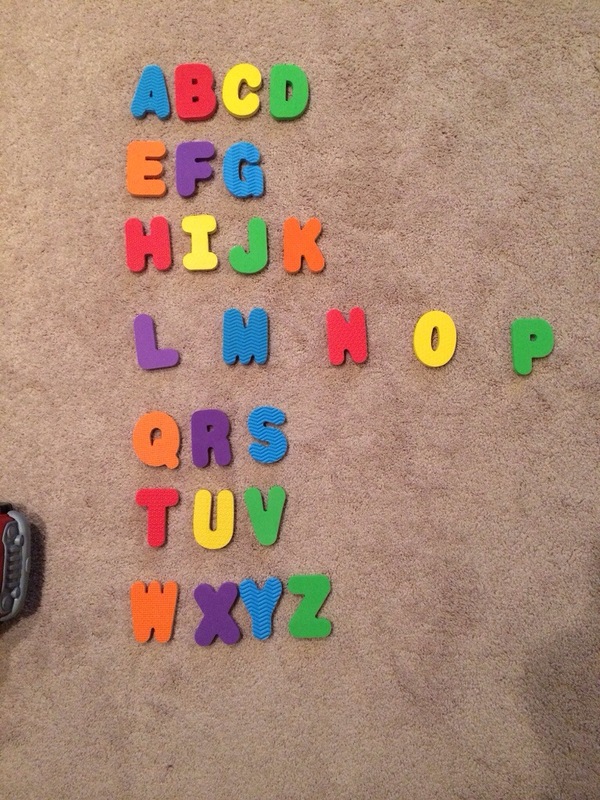 “Ba” counted for seven of her 31 words: baby, bottle, sheep, block, cup, bed, and bus). Three months later her word productions more than doubled! Part of that massive growth was due to the CAS diagnosis and strategies we implemented to help her speak. The other part of that growth was due to Joanna, who helped Isabelle turn her sound productions into words. Over the past two years, we’ve seen Joanna nearly every week. She has helped our family incorporate music into routines, in addition to helping Isabelle produce better sounds and words. She’s written songs to help Isabelle with concepts (e.g., up and down, on and off, open and close), for motor planning (i.e., “Hand on Top” was a song to help Isabelle hold her spoon correctly when self-feeding), and to help her participate in holidays (i.e., a simple thankfulness song for Thanksgiving to the tune of “Hot Cross Buns”). She introduced Isabelle to the drums, piano, guitar, xylophone, and more. I could go on, but I think you understand, Joanna has impacted Isabelle’s development in numerous ways. 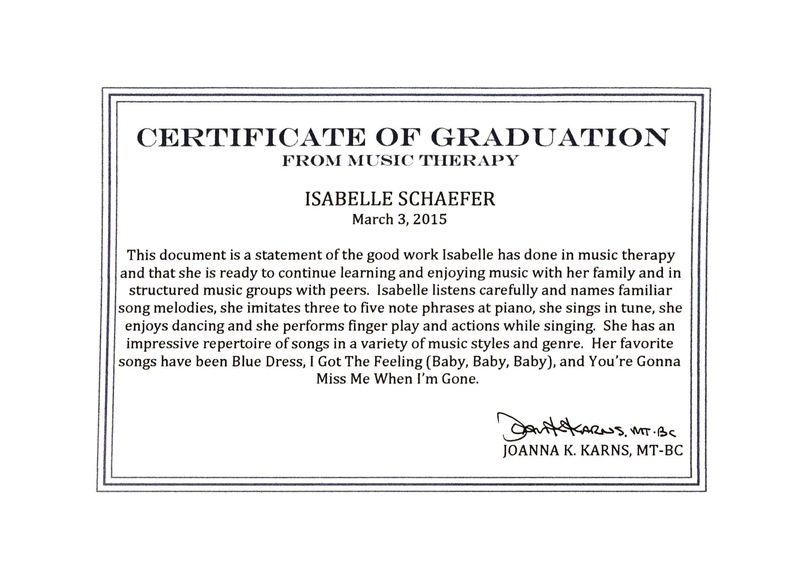 Perhaps that’s why my eyes got misty when Joanna presented Isabelle with a certificate of graduation from music therapy. She read it aloud to Isabelle, which made me emotional. We have come SO FAR. I know there’s more work to do in terms of Isabelle’s speech and motor planning. Thanks to wonderful therapists, like Joanna, we are in a much better place today than where we were two short years ago. 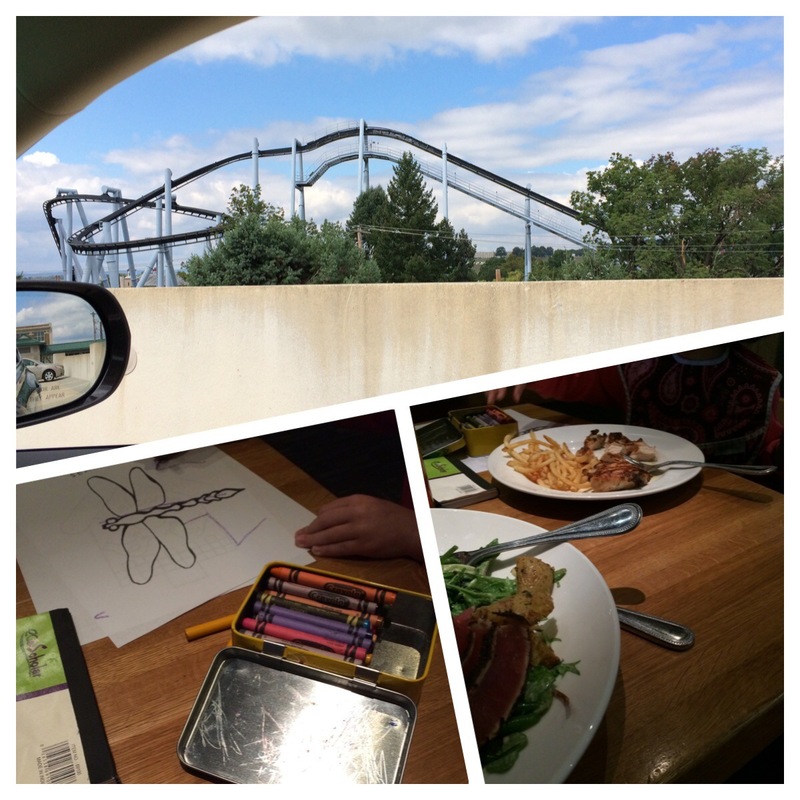 We watched one of the roller coasters, top, do a test ride in Hersheypark after lunch (which is featured in the bottom pictures). Tuesdays are the busiest day of our week now that Isabelle is in school*. And when I say busy, I mean BUSY. She has three therapy sessions from 9:00 a.m. – noon. Seriously! I’m just doing the driving (48 miles’ worth) — she’s doing the work! 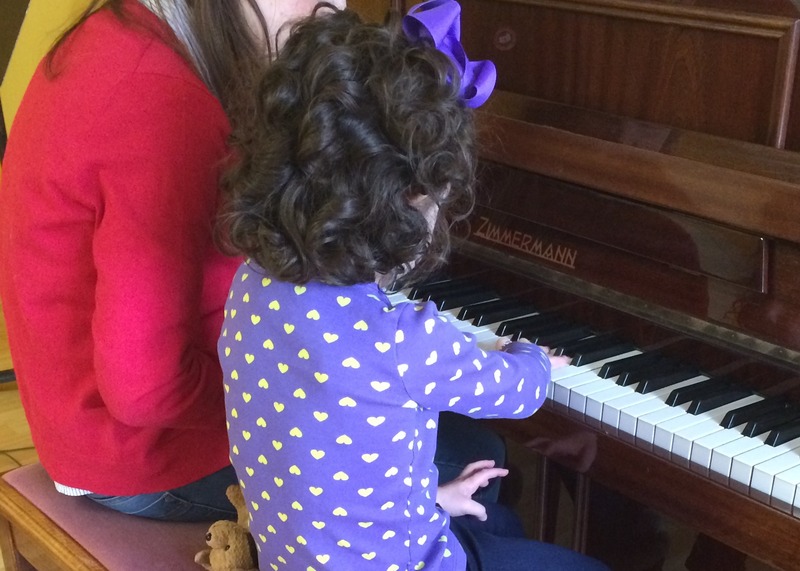 Her music therapist is available on first-thing on Tuesday mornings so we are in her office by 9 a.m. Isabelle sings, dances, follows directions, works on turn-taking, and more. Then we head to occupational therapy, where she has a 30 minute session (as opposed to the 45-60 minute session she has on Thursdays) since we don’t want to burn her out before speech therapy, which is the final session on Tuesdays. Her occupational therapist works with her on a variety of things that require motor planning, which she struggles with. She’s making great progress, but she’s only started to make progress with this second private session each week. Therefore, I couldn’t cut it either. I didn’t love the idea of packing three therapies into one day, but it had to be done. Childhood Apraxia of Speech requires repeated practice with speech during the week. While I do lots of home practice, there’s no substitute for her working with her a trained speech-language pathologist. Therefore, she sees her on Tuesdays and Thursdays. As long as Isabelle works hard in her sessions (THANKFULLY, she almost always works hard! The kid is a trooper with a growth mindset, which is why she’s my hero! ), we do something special afterwards. However, by the time she’s finished on Tuesdays, it’s lunchtime. She wanted to go for pizza today. I had pizza at the Apraxia Support Group meeting last night and last Thursday after her OT/speech sessions were over. My waistline couldn’t take anymore pizza. So, I mad three other suggestions. Who is this little person?!?!? “Not pizza. How about Panera, Chocolate Avenue Grill, or Devon?” I asked. “Yes! I wan chih-kihn, fiez, and apo jus,” she replied matter-of-factly. “Well, let’s get in the car and go out for a special lunch,” I said. She repeated her order again after I buckled her up in the car. Grilled chicken, fries, and apple juice. I smiled. At least she knows what she wants! Devon is not the kind of place I normally take a three year-old for lunch. It’s more of a Saturday night type of restaurant. But after she worked SO hard and willingly sacrificed her pizza lunch so I could eat a salad, how could I say no? I have a bone to pick with the person who wrote the “ABC Song.” It goes too fast through the letters l – p. This leaves little kids saying “elehmenoh” or even “ahbahbahbah” if their mouths can’t keep up. I separated foam letters into the phrases they’re sung. I put large spaces between the l and the m, the m and the n, the n and the o, and the o and the p. Then, as Isabelle and I sung the “ABC Song” together, she saw the spaces and heard the pauses in my voice. After awhile she began to slow down the way she sung the ABC song. 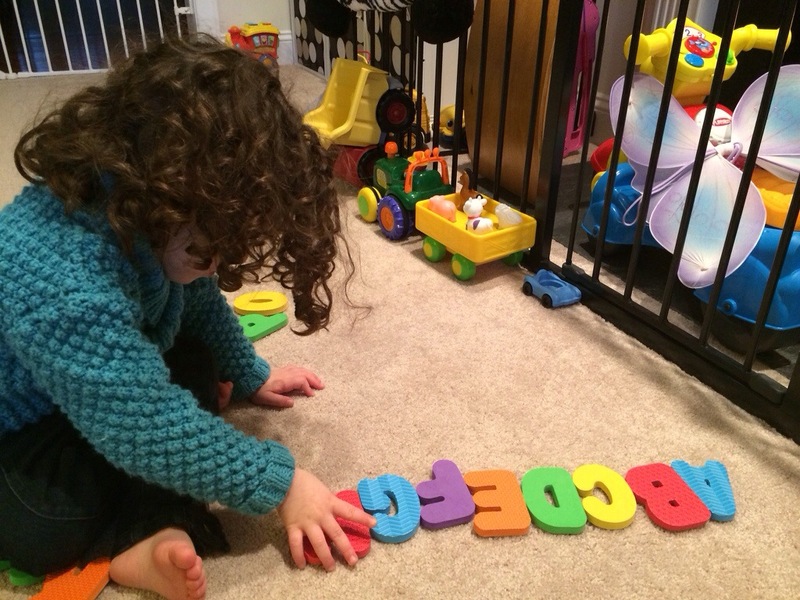 Isabelle also likes playing with the foam letters, which we only use together. I use them to practice sounds. For instance, we’re trying to get her to say the long a sound. Therefore, I put the a and the e letters by my mouth to get her to say elongate the word eight in an effort to say it properly. Here she is, though, just free playing with the foam letters after working on them with me. About two and a half weeks ago, Isabelle’s speech and music therapists worked with us to create a Thanksgiving song to the tune of “Hot Cross Buns.” During that time, I’ve worked with Isabelle to brainstorm a list of things and people she was thankful for this year. 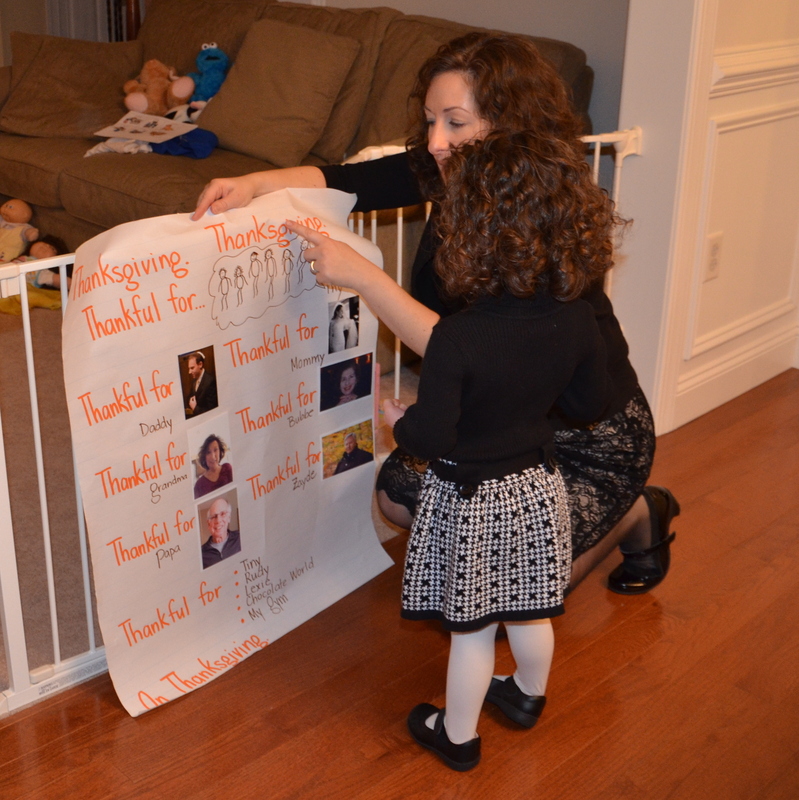 Since thankfulness is a pretty tough concept for a toddler to grasp, we started out by talking about things she loved. The list ranged from her family to our neighbors’ dogs to her friends to her teacher to Chocolate World. I tossed and turned in bed for an hour and a half last night before getting up to work at my computer. Before I rose from bed I heard Isabelle coughing on the monitor. And once I was downstairs in my office, which is directly below her bedroom, I heard more coughing. This isn’t going to bode well for tomorrow. And I was right. The first thing I noticed when I saw Isabelle this morning was Isabelle’s runny nose. I armed myself with a giant canister of Boogie Wipes and made myself a cup of strong coffee so I could power through the day. Speech and music therapy went pretty well even though I was wiping my little girl’s nose every few minutes. Once everyone left the house, I packed her up and took her to the post office and the grocery store, which were two errands I really needed to do. Her nose hardly ran while we were out so I asked her, “Would you like to go outside?” when we got home. Well, that was clear. My little one loves to go outside. Her request to stay indoors spoke volumes about how she must’ve been feeling. 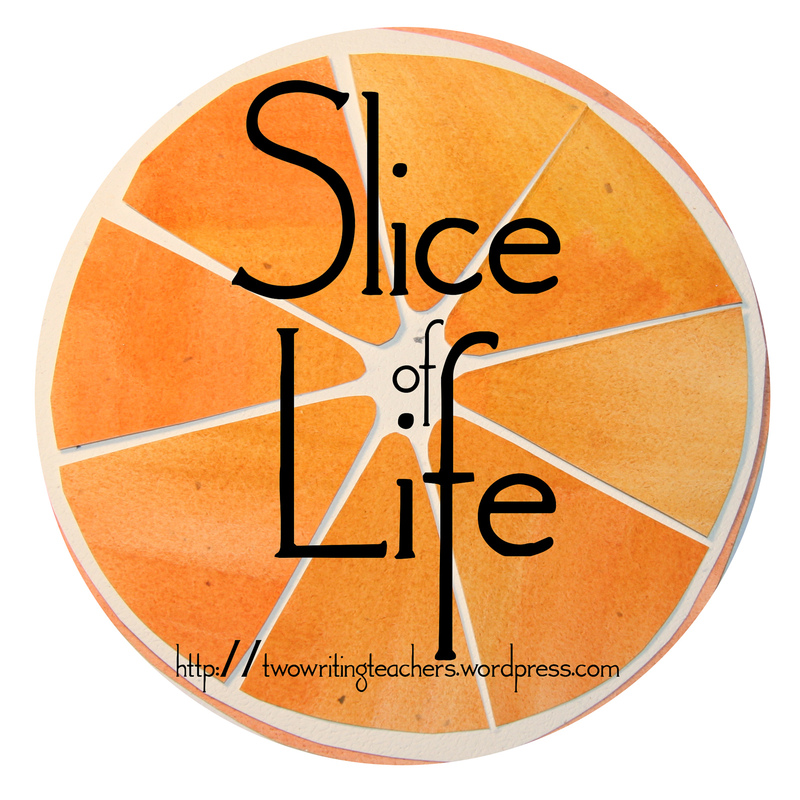 I poured her a glass of orange juice and declared that all rules were off. “Would you like to watch ‘Seasame Street’?” I asked. “Yes!” she squealed with delight. I heard the slightest of whines. “El-ma!” she said pointing towards the TV. “Elmo wants you to have clean hands if you’re going to watch ‘Sesame Street’.” Stupid things I vowed I’d never say before having a child. She took off her coat and marched herself to the bathroom for a scrubbing. Well that was easy. Not only did she watch “Sesame Street,” but she watched two episodes of “Daniel Tiger’s Neighborhood.” This is usually the amount of TV she watches in a week’s time! However, I’ve learned not to be nuts about media consumption when she’s sick. At 2:15 p.m. I got her down for a nap. I had lots of work I needed to do so I hoped she’d sleep for 2.5 – 3 hours. Isabelle was up by 3:30 p.m.! At first she wanted to snuggle in my bed and read books. That was all well and good, but then she requested something else. We went downstairs with Schlepp, her teddy bear, and retrieved the iPad from my office. I set her up on the couch so we could watch the video together. A half hour later we’re still here! She’s watched every one of the Maccabeats’ videos(+ one Stand Four video), which means we’re not just ready for Shabbat, but we’re ready for Chanukah, Purim, Passover, and Sukkot! I know some people wouldn’t have stayed in with their kid if they had a cold. However, I’ve come to believe that if one can stay in and rest when their body shows some kind of illness, then they should. Hopefully all this rest (and all of these videos) will help Isabelle feel better soon! Isabelle didn’t want to get ready to go to bed tonight. Therefore, I infused music into her bedtime routine. My pick was the high holidays melody that’s traditionally sung at this time of year. I combined a niggun (wordless melody) with the words “L’shana tova tikatevu. A happy, new year. Happy new year to you.” (L’shana tova tikatevu means “may you be written down for a good year.” It’s typically how people greet one another on Rosh Hashanah.) Well, Isabelle took the word tikatevu as an invitation to tickle her own belly each time I said it. The first few times I told her, “It’s tikatevu, not tickletevu. It doesn’t mean you tickle yourself.” But after the fourth time I realized I was fighting a losing battle. So, I grabbed my iPhone, put it behind my back, and recorded me singing the song while she tickled herself as much as she could.